Michael Jackson is reportedly out to end his long-standing feud with Sir Paul McCartney - but not until the King of Pop is six feet under. According to the Mirror newspaper, Jackson is leaving his share of the Beatles back catalogue to McCartney in his will, all in hopes that it will end a bitter 24-year rivalry between the two and "make things rights." 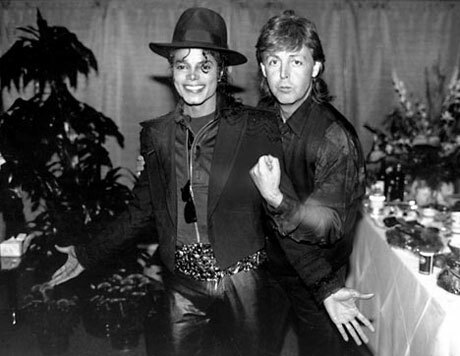 The former friends and collaborators had a very public falling out back in 1985, when the then-financially prosperous Jackson outbid McCartney in an auction for the publishing rights to the Lennon-McCartney songbook. Since then, the stars have rarely spoken, with McCartney once saying in a 2006 interview: "You know what doesn't feel very good, is going on tour and paying to sing all my songs. Every time I sing 'Hey Jude,' I've got to pay someone." The Mirror report did not say exactly why Jackson has had the sudden change of heart, but one source close to the singer said Jacko has always regretted the way things turned out between him and McCartney. "Michael is worried about his health so decided it was time to look at his finances," the insider said. "Most of his estate has been divided up between his three children. But Michael told his lawyers he was sad he no longer talks to Sir Paul and said he wanted to make things right." The news follows previous reports that 50-year-old Jackson is near-death and battling a terminal lung disease, and that he will auction off more than 2,000 personal items this spring, a move many suspect has to do with his failing finances.